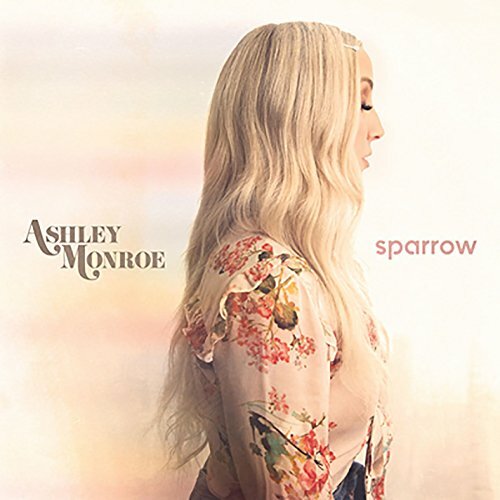 On April 20th, Grammy-nominated singer-songwriter Ashley Monroe released her wonderful fourth album 'Sparrow' via Warner Music Nashville. It was recorded with excellent producer Dave Cobb (Chris Stapleton, Sturgill Simpson, Mary Chapin Carpenter) in Nashville’s legendary RCA Studio A. Working with some of her closest collaborators, including Brendan Benson and Waylon Payne and longtime friends Anderson East and Angaleena Presley, Ashley wrote all of the songs on 'Sparrow.' She also recorded the album while she was pregnant with her first child. "I felt powerful," she says. "I wasn't puffing, I wasn't drinking wine, I was just singing. I knew I wanted to work with Dave. All of his records are consistently awesome and classic, timeless, old and new all in one." Together, they shared their favourite records and musical moments, like early Elton John albums and Glen Campbell's "Wichita Lineman," moulding 'Sparrow' into its own unique sound and space. "Country music is a wide genre, and that's OK," Ashley says. “I don't even know what genre this record is, but I know it's me." The album a follow up to Ashley's 2015 Grammy nominated album 'The Blade' has a real cinematic feel rich with high quality arrangements, musicianship and sweeping string sections. It also has a retro quality but coupled with a fresh new twist. Dave Cobb is one of my favourite producers and I think Ashley made a fantastic decision to have Dave on board as a key member of the project. Sparrow's sound is influenced by Ashley's favorite Glen Campbell and Bobbie Gentry records. She recorded it last year, while four months pregnant. It is also her most personal release to date. "Dave’s studio was built for strings and they sound so beautiful in there...and I’m a sucker for strings….They pull on my emotions and I love that. I wanted to pull out the emotions of these songs." She cited "good therapy" as the force behind the record, which features gorgeous, plaintive songs like 'Daddy, I Told You' and opening track 'Orphan' "I just dealt with things from childhood that I really hadn't dealt with properly," she explained. "I lost my dad when I was 13, and grief does crazy things. In your 20s, you do unhealthy things to not feel what you're feeling. I got to my late 20s and was like 'I've got to go deal with this crap'.... When I did that, all of these songs just started pouring out. I couldn't stop them. I could tell it was a fresh start." Now 31, Ashley originally from Knoxville, has spent more than half her life in Nashville pursuing a career in music. It's been a rocky road, but she wouldn't change it even if she could. "I look back now and think all of that was supposed to happen…. I never thought well, I think I’m going to give this up. I always knew in my heart that it was going to work, and I still do. I feel really grateful for everything that’s happened to me, even the bad things, the unplanned things, because I feel like I’m living my dream right now." The album opens with the beautiful, heartfelt and soul seaching "Orphan" written by Ashley, Gordie Sampson & Paul Moak. It really sets the tone and the feel of this high quality album. With a beautiful turn of phrase Ashley poetical contrasts a orphan child to a fledgling sparrow fending for itself. Deep and mournful cello backing adds to the atmosphere. "Nobody told me what I should do. When the world starts to rumble and shake under you....With no direction. Its wings in the wind. How does a bird know more than us?” Ashley sings in a graceful, aching tone over a sweeping string arrangement. The tempo rises for "Hard On A Heart" written by Ashley Monroe, Blu Sanders and Paul Moak. It has a little bit of a Fleetwood Mac/Stevie Nicks vibe. 'You never know what you up against...fighting a war that you can never win..........'. The first single release from the new album "Hands On You" is a steamy and sultry retro infused masterpiece written by Ashley and Jon Randall. Full of catchy guitar grooves, rich organ melodies and string arrangements. It also has rich cinematic feel and could easily have been part of of a movie soundtrack. The sparkling pop-soul arrangement of "Mother’s Daughter" reminds me of Bobbie Gentry. The style plays again the lyrics' skepticism about the strength of the mother/daughter relationship and fear of inheriting the same destructive patterns. "Staying forever is a promise that nobody can keep," Ashley declares ruefully "Staying forever is the biggest lie she'll ever believe". Rich cinematic string arrangements weave their way through "Rita" written by Ashley, Nicole Galyon and Paul Moak, evoking the dusty pop of Tumbleweed Connection-era Elton John. The deep passion and craving continues in "Wild Love" with it's bass pulse and sweeping strings. The reflective country soul ballad "This Heaven" written by Anderson East, Ashley & Aaron Raitiere is a tale of love and continues the theme of close relationships. "I'm Trying To" is a tale of lost love, regret and trying to moving on. "I'm trying to for the sake of me and you. Just keep at it like nothing happened. I should let you go, I know you're trying to move on. I'm trying too.......How long do you try before you let it die? What do you need to know before you know? Trying to read your mind is like driving when you're blind. If only all this trying made it so". The tempo rises for the beautifully retro "She Wakes Me Up (Rescue Me)". "I love my baby, she's the light of the world. She wakes me up with the sun in her eyes. She's not perfect but she's my little girl and the night goes cold when she cries. Oh my baby, you're my angel. Won't you come on down and put your arms around me? Oh my darling, oh my angel. Won't you come on down and rescue me?" "Paying Attention" is a wonderful orchestrated pop number with a beguilingly melody, capturing the painful merging of regret and desire. In the very personal "Daddy I Told You" written by Ashley, Angaleena Presley and Josh O’Keefe, Ashley reflects on the innocence of vows made as a child to her father. "Daddy I told you I was gonna fly. I'd get out of that town alive. Don't worry, I kept your name and your picture in a frame. Just like you, I got a lot in my heart. It won't let me fall apart. I'll always be your little girl. I love you more than this whole world." Ashley has fulfilled her promise to grow beyond their small town, while at the same time vowing to keep his spirit close beside her like a beacon. This high quality album finishes with "Keys To The Kingdom" written by Ashley & Waylon Payne, which explores a spiritual reunion with long-lost loved ones. It's a personal and heartfelt hymn as Ashley reflects on her personal vision of heaven, surrounded by “everyone I’ve ever loved and then some,” hearing the voice of Elvis while reuniting with her late father. What Ashley accomplishes with her excellent new album 'Sparrow' is both wonderfully subtle and breathtaking. Excellent songwriting, musicianship, vocals and arrangements with the strings especially adding a touch of real class. 'Sparrow' is a fantastic fusion of folk, country, gospel and pop coupled with very powerfully heartfelt personal expression and sentiments. Highly recommended.